Moth beans are soaked and cooked. 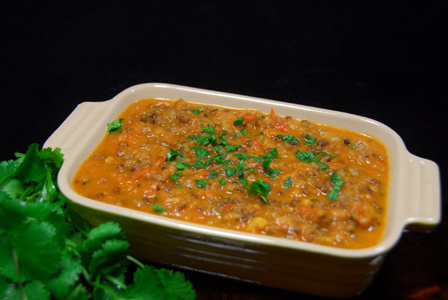 Tomato onion gravy is prepared by roasting the tomato and onion and grinding them into smooth paste. Cooked moth beans is finished in the tomato onion gravy and powdered spices. Serve moth tomato masala with plain or flavored rice or with roti. Makes: around 4 Servings of Moth Tomato Masala. Soak moth beans in water for around 4 hours. Pressure cook in 2 cups of water for 2 whistles. Heat a tsp of oil in a pan, add chopped onions. Fry till onion turns translucent, add tomatoes and cook till tomatoes turn soft. Cool the cooked onions and tomatoes to room temperature and grind them into smooth paste using a blender. When mustard seeds start spluttering, add green chiles, ginger garlic paste and fry for few seconds. Then stir in ground onion and tomato paste, cooked moth beans, cumin powder, garam masala powder, red chilli powder and salt. Cook for few minutes, stir in half a cup of water if necessary. Cook on low flame for around 5 – 10 minutes and remove from heat. Garnish the moth tomato masala with chopped cilantro. Serve moth tomato masala with plain or flavored rice or with roti. Notes: Make sure moth beans are cooked well. Suggestions: Adjust spice with green chiles or with red chili powder. Variations: You can also check other recipes with moth beans here. Other Names: Moth Tomato Masala. Moth beans are soaked in water and cooked till just soft. They are then added to the oil after frying onion. A freshly ground spice mixture is added to the oil for heat and taste. 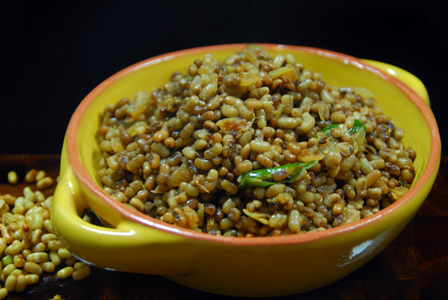 Serve masala moth beans as a snack or with steamed rice. Makes: around 4 Servings of Masala Moth Beans. Soak moth beans in water overnight and pressure cook with around a cup of fresh water for 3 whistles. Grind cloves, cinnamon and coriander seeds into fine powder using a spice grinder. Once onion starts to brown, add ground spice powder. Fry for couple of seconds, stir in cooked moth beans, red chili powder and salt. Cook for around 5 minutes and remove from heat. Serve masala moth beans as a snack or with steamed rice. Notes: Make sure moth beans are cooked right. Variations: Check other recipes with moth beans here. Other Names: Masala Moth Beans. Red chori roti is prepared with soaked red chori and rice flour. Rice flour is made into soft dough using hot water. 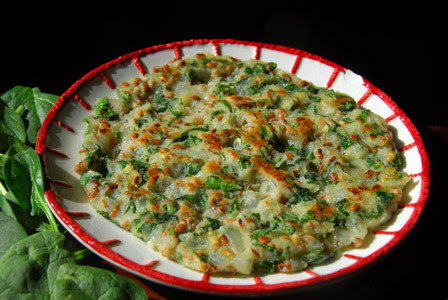 Red chori and other seasonings are mixed along with rice flour and spread into thick roti on a pan. 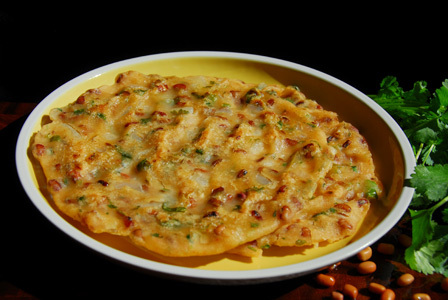 The spread rotti is fried on flat pan until lightly crisped and served hot with pickle. Makes: 2 – 3 Red Chori Roti. Wash, peel and finely chop the onion. Wash, remove ends and finely chop the green chillies. Soak red chori in water overnight and refresh them under fresh water next morning. Bring 1 1/2 cups of water to a heavy boil and keep aside. In a mixing bowl, add rice flour, soaked red chori, onion, green chillies, red chilli powder, cilantro and salt. Add sufficient amount of hot water to the bowl and mix the mixture to form soft dough. Knead with hands for best results. Use enough water to let the mixture come together. Divide the dough into 2 – 3 portions. Place flat pan on medium heat. Before pan gets hot, take one portion of dough and place it on the pan. Press the dough with help of fingers to spread it into a circle. Drizzle half a tsp of oil on the roti and cook covered for 3 – 5 minutes. Uncover, turn the roti on other side and cook for few more minutes. Serve red chori roti with any pickle of your choice. Notes: Make sure to cook the roti covered. Suggestions: If the roti is too soft, put it back on the pan and fry for a minute or two to crisp it up. 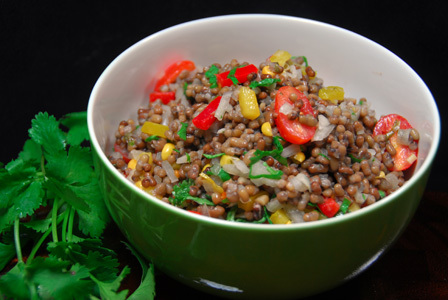 Variations: You can also add black chickpeas, or any other whole peas in place of red chori. Other Names: Red Chori Roti, Alasanda Rotti, Bobbarlu Chekka Rotti.